We were happy to land at the Dingwall CCC site and feel the softer air of the Cromarty Firth. Much of the journey has had us parked in the teeth of high winds. Even on very warm days the wind from the North East has cooled us down so that days without fleeces have been few and far between. The main benefit of the coastal route is that midges are not keen on windy conditions so we’ve been largely safe from the worst of their gnashers. Dingwall felt warm, the air balmy and therefore alive with the dreaded critters. We can say with some certainty that our very own cocktail of Smidge and Avon Skin so Soft (Original) does keep them away. Or at least they approach and land but don’t seem to bite. They do however look for places that you haven’t applied the cocktail so be very careful of wide legs on trousers, or worse, shorts – they do love ankles and horrors – the hot tender places that shall remain nameless. We’ve enjoyed our few days here hugely. One highlight was meeting up with our friends Dawn and Linda who moved up to the Highlands last year. We had a grand walk together near Strathpeffer with our combined four dogs and enjoyed a great catch up. Poppy disgraced herself by picking a bit of a fight with Harris, their cocker spaniel but then Brodie, their Labrador made up for it by trying to shag Boo, who was outraged in a rather camp way glaring at Brodie with a “how very dare you?” look. He was giving a mixed message if ever I saw one. No wonder Brodie wasn’t sure. This is the Strathpuffer skeleton. The route is a mountain bike challenge and this one didn’t make it. Lunch afterwards was a great treat and we parted feeling sad to leave yet grateful for friendship. It’s amazing how, even after a few years of not seeing one another, you can just pick up the conversation as though no time has passed at all. We made a grand plan for the next day then sadly had to abandon it due to bad weather. The thing is that having started the NC500 in Oban after our trip to Tiree and ending in Inverness we have in fact missed a final short part of the circuit – the Inverness to west coast bit. We discovered that it’s possible to go from Dingwall to Kyle of Lochalsh by train and we were told that it is a beautiful route, taking in some of the best scenery in the area. Having planned to do it we woke up to find the rain lashing down. Reluctantly we decided to take a rain check (see what I did there?) as we would see little of the scenery and would end up with an hour to spend in Kyle in the rain. If you’ve been there you’ll understand that it isn’t much of an option as there is little to do there that doesn’t involve a brisk walk. If the weather had been fine we would have walked over the Skye Bridge just for the fun of it. This plan is now on hold for our next trip to the Highlands but if you’re lucky enough to get good weather consider the return train trip for a fun day out. It makes a good change from driving too. So, what did we do instead? We got on a train going the other way and went to Inverness shopping. It was bleak and raining in Inverness and while there we had a moment of joint self-discovery. Our weeks of travelling in remote places, where shops are hard to find, had changed our feelings about shopping completely. It was busy, there were too many people and, incredibly, we were bored! So we got a couple of T shirts and a new pair of walking shoes for yours truly and then went into a nice bar/restaurant and ate until it was time for the train. Our appetite for food, unlike our appetite for shopping, remains fully functional. Dingwall is almost the final stop of our North Coast 500 tour. From here there is one last stop at Brin Herb Nursery, just south of Loch Ness, for a Highland Motorhomer’s Meet and then we’ll be heading south for a couple of weeks in the Lothians. There’s a feeling of ending, certainly of this particular part of the trip and it has got me reflecting on the whole experience. So, six weeks later and a lot of different sites visited I have become aware of the other side of the coin. Sites where people take absolutely no notice of rules or requests are even worse. If a campsite has no member of staff available to deal with anti social behaviour it can easily make the whole experience miserable for everyone. Fortunately we only came across one like that and it was pretty stressful. As I strolled around the lovely site at Dingwall I was reflecting on the communal nature of life on a camp-site. By their very nature they are places where you are living in closer proximity to others than normal. If you use the site facilities you share showers, toilets, washing up facilities and laundry with a number of other people – strangers in fact. On a well run site there is a pleasant sense of community with people greeting one another and sometimes stopping for a chat to talk about the day’s activities or plans for the next day. Facilities are clean and work well and the wardens are friendly and helpful. This is our experience of Dingwall and indeed several others of the sites en route. Modern life is usually very privatised so we’re not used to sharing resources and facilities. People value ‘doing their own thing’ and so taking up motorhoming, or caravanning, can be a bit of a challenge to our normal way of life and our view of the world. It is definitely not for everyone. This trip has raised our awareness of something we haven’t thought about before. We’ve had to live alongside other people … people we would normally never meet or socialise with and at some basic level, get along with them. We’ve watched people on sites living their lives in completely different ways to the way we live ours. Some people stay up ’til all hours then appear sleepy and disorientated long after everyone else is up and doing. Some are pernickety to an incredible degree, trotting round their vans wiping away any visible spot wearing rubber gloves and aprons. Some have faces pinched with tension and appear not to be speaking to their other halves. Others can be heard swearing at one another. We’ve seen some very elderly people having a whale of a time and giving us hope of many years of fun still to be had. On one site I watched a man trying to help his very disabled wife get in and out of their van and sensed that this was their last trip together. I didn’t know whether to offer to help or just turn away rather than stare – in the end I did nothing. I was sad all day after that. When we’re in our houses we just don’t see this stuff. We’re sheltered from one another and I don’t know if that’s a good thing or not. Another thing we’ve become more aware of is the way that we use resources. When we’re at home we switch on lights, heating and water without a second thought. We’re disconnected from the processes that bring all these things into our homes, other than the direct debits that pay for them. In a motorhome you have to fill your water tanks, empty your waste and toilet and fill up your gas containers. Every drop you use directly involves your own effort. Sometimes it’s easy – where there’s a good service point – and sometimes it involves carrying fresh water from a tap in a watering can and removing waste water in a flexible bucket and emptying it down a drain. After a few weeks of using the gas from the big refillable bottles we have on board, we have to start looking for LPG at petrol stations as only a few stock it. Live like this for a few weeks and your relationship with the things that make life comfortable becomes more intimate and there are often moments of real gratitude when, for example, you find a good place to replenish the water tanks. Today is exactly three months since we left the house. We’re parked beside Loch Meig in the Highlands. Shirley is fishing and I’m sitting looking out over the loch writing this. The dogs are sleeping peacefully and there is a profound feeling of peace. We have much to be thankful for and surprisingly I find myself wondering how we’ll adjust to life back in a house when the time comes. First stop in Dingwall for me was the fishing tackle shop – not to buy any more tackle, just to ask advice. One man was behind the counter and another two men were engaging him in blokey conversation. After a few minutes they noticed me. Man behind the counter shouted “Eileen!” and I had one of those flashback moments to the comedy sketch where the guy in the shop shouts “Margaret!” which brings Margaret scuttling from the back shop! Eileen appeared and asked if she could help – and she certainly could. She told me about local lochs and fisheries, where to get permits etc. Loch Meig sounded like the best place for me. After a long trundle along a single-track road we arrived at the car park for Loch Meig. I prefer to fish from the bank and so I set off down to the loch to get at those fish. Much of the loch has trees lining the bank making casting difficult so I walked along the road and stumbled my way down a steep bank to the shore. 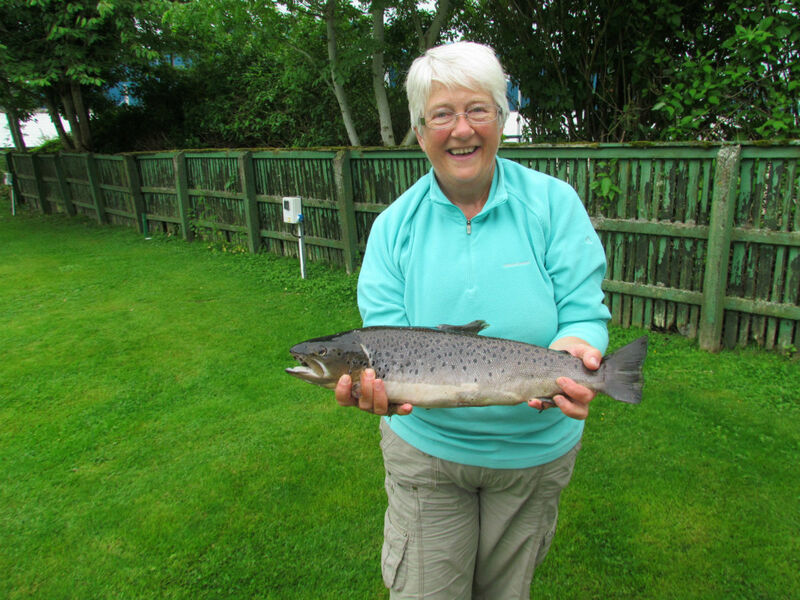 Very soon I had hooked my first fish and landed it successfully – a nice wee brown trout just under a pound I thought. The next fish wasn’t keen to be caught but I eventually landed it – nearly 4 pounds! The biggest wild brownie I’ve ever caught! My last fish of the day was over a pound. I returned to the car park with a spring in my step lugging my bag of fish. There I met the other fishers coming in from their boats. “Catch anything?” they asked cheerily. I showed them my catch. Two of them were really impressed, congratulated me, the third called over, “I hate you!” Ah, the cheery banter of fisher folk. The ghillie with the other fishers was truly impressed, asked what fly I’d caught my fish on, where I was fishing, all good info for him to share with tomorrow’s fishers. He was genuinely interested in my fishing success and even weighed my biggest fish for me. Another great day’s fishing and tomorrow another great day’s eating. One day a few weeks ago we found a strange pair of glasses in the van. They looked quite new and were completely unfamiliar to us. We racked our brains as to who might have left them here and contacted a few people who’d been in the van, asking them if they’d lost their specs. No-one had any idea whose they might be so we put them in a safe place until the owner could be found. Today I was playing my Irish whistle (this is not a euphemism) when I thought to myself ‘I wish I’d brought my new music reading glasses with me’ and then, in a flash, light dawned and I realised whose glasses we’d found. They were mine. Numptiness is alive and well in Holly the motorhome. Me thinks you have been bitten by the full-timing bug!! Great following your trip but wonder if you will really settle back in bricks and mortar when the time comes! I have really been enjoying your blog. You have a great way of telling a tale, Margaret. Leo and I will be off on another trip over August and September, touring the far North Queensland in our slide on camper. I am really keen to do something similar to this blog. Can you please advise how I go about it? Thanks for a great read. Your observations of others and the differences between living at home or in a van are wonderful. A real eye opener. We’re saving for our first van and can’t wait to experience getting away from the rat race. I’ve got to admit to being very envious! I know most of the places you’ve visited but only having visited them for a very short time before moving on to the next place or back to our B&B! As a photographer to actually be there and witness the sun rise or set would be great. As we’ve got a little Bichon Frise, we’ve always had trouble with accommodation that is dog friendly. What is the main problem you find with having your dogs in the van? Thanks for your kind comments about the blog. Really glad you’re enjoying it. We’ve had no problems at all with the dogs in the van. They adjusted well to the life and enjoy the variety. I think they like having us close by a lot of the time. Hope you get your van soon. ? Can confirm the trout were delicious. Love your reflections on use of resources … we’re wilding again and so the Shewee and PeePeePot are back in use! Really enjoyed your company over the weekend.